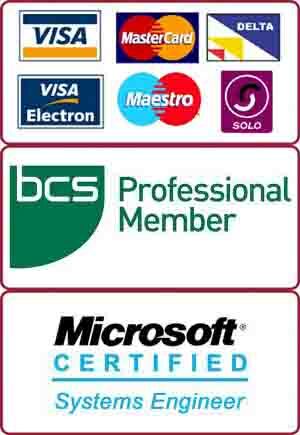 Our team of qualified IT professionals is one of the best in London for onsite and remote support. We come to your doorstep to fix any problem relating to PC, Mac or any other operating system. We cover most areas including Central London, South London, West London, South West London, Putney, Barnes, Wandsworth, Balham, Tooting, Clapham, Battersea, Southfields, Roehampton, Wimbledon, Richmond, Kingston, Raynes Park, Chiswick, Hammersmith, Fulham and surroundings. £60 per hour flat fee. Data Backup / Recovery / Transfer. Our local estate agents were relocating their office a few streets away. They asked us for onsite IT support to help them move their computer systems to the new office and set-up everything as it was. There were 8 Windows based desktop computers in total. The client had already disconnected them from network and moved to the new office. We sent our engineer to their new office to run the LAN cabling through conduits, connect everything in a proper order and setup the new broadband connection. The network printer and scanner also needed to be setup for the new office. Our engineer finished the job in a few hours and made the client happy! Wireless printers are becoming increasingly popular these days as most of the households have more than one computer. If you are thinking of buying a printer, go for a wireless one. You can even print your emails directly from your phone or tablet. If you have iPad or iPhone then buy a wireless printer with Air Print option. Low signals for wireless network / wifi is a common problem in areas like Fulham. To boost the signals, we would recommend using powerline adapters. Powerline adapters are great in terms of increasing signals of a wifi network. They use the existing power cables to transmit and receive the data. They are easy to setup and also cost a fraction of running LAN cable through your house. For virus removal, there are quite a few tools in the market that can clean your computer. Try using Combofix,Malwarebytes and YAC. For a free advice and quotation, call us now on 0207 6100 500.